This site will look much better in a browser that supports web standards, but it is accessible to any browser or Internet device. 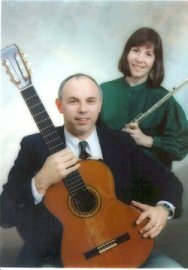 The McKenzie Duo, one of the Chicago area's finest flute and guitar duos, is the musical partnership of husband and wife team of flutist Sue McKenzie and guitarist Mark McKenzie. We have been performing together for over ten years, for weddings ceremonies, banquets, dedications, memorial services, as well as for concert performances. We draw from diverse musical backgrounds, including classical, popular, jazz, traditional and ethnic styles. The warm and versatile blend of flute and guitar is well suited to a wide range of musical styles and periods, from Beethoven to the Beatles, from Medieval dances to today's favorite songs. We believe that live music is best, and our aim is to provide quality music and appropriate selections, to entertain or set the mood for any occasion. Visit the Listening Room to hear our demo recordings. See the Contact page to get in touch with us to for further information, availablity, and pricing.